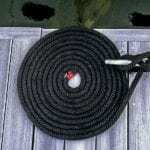 Home Boating Tips	There Are Many Ways to Coil a Line! All too often, people just bundle lines together, deciding to deal with the mess later. But that can end up becoming a serious problem if you have an urgent need and you can’t get to a line quickly. When operating a boat, and dealing with variables of tides, currents and unpredictable weather, having quick access to a rope, or ropes, can be the difference in having a great day on the water or dealing with thousands of dollars in damages and weeks of headaches. 1). Start by coiling the line into your free hand. Don’t forget to leave a bit of a twist to the right with your other hand. 2). Continue to coil the line, giving yourself a couple of feet of slack. Put several wraps around the middle of the coil, working upwards until you are out of line. Then pull the bite through the top of the coil (as shown). 3). Pull the bite down over the shoulder of the coil and snug it up against the rap that you’ve made. 4). Pass the end of the line back through the top of the coil (as shown) and you are now free to hang the coil on a hook or stow it in a locker. If you need this line in a hurry you can easily undo what you’ve done and toss the line correctly to the person at the dock.